Glendale is a truly magnificent cottage. 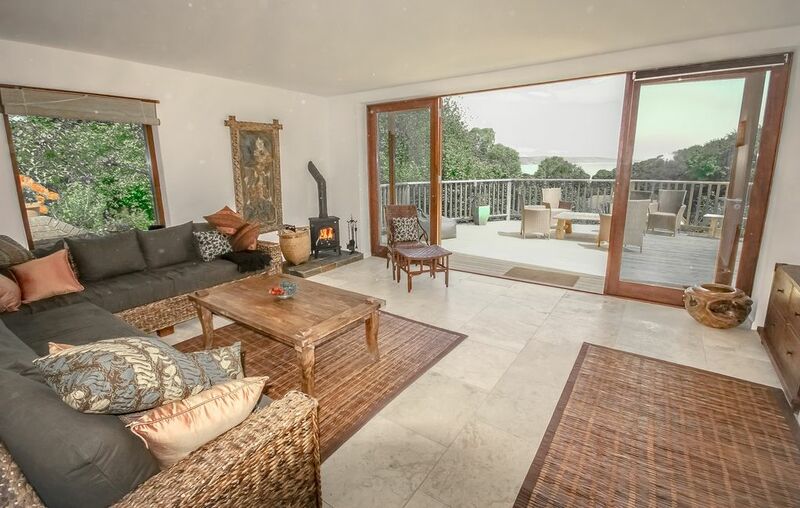 All three bedrooms have stunning sea views with french doors leading out onto a panoramic deck. Two luxury bathrooms make things easy and the lounge is the perfect place to drink a glass of wine and relax in front of the log burner. The French doors lead from the lounge onto the deck with views nothing less than inspiring. The kitchen is gorgeous and the best part of the house is the award winning log burning hot tub. Sit in the tub at night and remember what is really important. It's why you come on holiday. The house connects directly to the Coastal path. A short walk through the woods and you end up on Glen beach - full of tidal pools, and secluded coves. It's a safe beach, with good fishing, and fantastic for kids - give them a bucket and spade and they're off. Dog owners/Parents can walk easily from the house directly to the coastal path without having to see a car. Alternatively, turn right at the front gate and within a couple of minutes your in Saundersfoot village. Hi, we are Amie, Chris and Che. We have recently restored this lovely Cottage. It is a very special property full of character and charm - we are sure you'll love it too. The location is everything. The cottage is literally on the coast path. You can step through the gate and walk a short distance along a path in the woods to the beach, takes approx 6 mins. Alternatively, you can turn right from the property and walk on a pavement to the village, takes approximately 5 mins. The cottage has wonderful views overlooking the sea and Swallow tree woods. A gorgeous hot tub to totally unwind, and situated directly on the coast path, you have the best of Pembrokeshire at your doorstep. The perfect holiday. Using the hot tub - Children in the hot tub must be supervised at all times. The use of the hot tub is at your own risk. We accept no responsibility what so ever. We provide the first basket of wood for the fires. A kayak for the sea, a surf board for the waves, and the exquisite Pembrokeshire Coast National Park at your doorstep. Although, we welcome everyone we do have to caution you that there are stairs in the house, as well as, the garden. This make accessibility difficult for some. We welcome you to holiday with your dog but please ask that you keep him or her downstairs and, of course, please pick up after them in the garden and on the beaches. We also request that there is no smoking inside the house. Fabulous location, stunning views, relaxing surroundings. Saundersfoot is a great location to enjoy with all the family. The position of Glendale is perfect, great access to the beach and once the tide is in not a bad walk back via coffee shops or St Brides with it’s stunning views. Glendale is well equipped for a family, with a dog, the log burner was a must and the hot tub was a hit even with the 3hr heat up! The tide clock was essential!! Great holiday and brilliant weather too. Thank you for the review. We're happy to hear you had a good holiday! Sitting on the sun deck overlooking the sea and the woods was one of the best ways of relaxing and de-stressing. If that wasn't good enough there was always the hot tub. The main room was a good size and looked out onto the sun deck. The bedrooms were lovely as they also had sea views from their bed! The walk to the centre of Saundersfoot and the beach was only 5 minutes away. In the other direction we were on the Pembrokeshire Coastal path in 4 minutes through the woods. The walk to Tenby was beautiful and good exercise!!! We also enjoyed the use of the 2 kayaks for a paddle on the bay at Glen Beach. I have already told friends to have a look at the Cottage and West Wales. Loved it. Pics in the website need updating as a few of the internal items have changed but essentially it’s spacious, great bath and shower, easy access to beach (great for dogs and rock pools), great bbq etc. Hot tub was superb but be aware it takes 3 + hours to heat and you have to add more logs every thirty mins or so. (Could be because it’s themisdle of March!). Essentially it’s a lovely private place with gorgeous morning views from all of the bedrooms. Be warned the pagoda, swing and paths in the garden are totally unusable after heavy rain - very muddy and quite steep - however it’s amazing without that. Great price for what you get and close to some really good attractions if you have kids. (Anna Rider Richardson’s Manor Farm was superb and Folly Farm was also really cool). Both of these are about a 8 minute drive. Pendine sands (speed trials) are not far and neither is the beautiful Milford Haven for those divers out there. Tesco metro is a 2 Min trip away and lots of coffee shops and seafront tat shops in Saundersfoot too with some great breakfast/lunch spots. All in all money well spent. Thank you to the owners. Thank you for such a lovely review! So, sorry about the road works above the house. They have been making a much needed foot path. Had a beautiful half term stay. Weather was lovely and the walk down the beach, although steep and slippery opened up to a lovely beach. House was as shown in the photos. Only notes would be that if you want to bake a lot, the oven is really great (loved the width) but the tiled worktop isn't. To be fair they're in the photos so just bring something to roll out pastry/kneed dough on! Also the hot tub isn't as in the photos and not as quaint. However, overall a lovely place to stay and we thoroughly enjoyed it. A very private setting with comfortable and pleasant furnishings. We, unfortunately, had very bad weather which made the garden virtually inaccessible as it was so steep and muddy. There were some steps, but dogs don't tend to stick to those. The beds were very comfortable so we all slept well. There were some problems with the heating and hot water but these were fixed after calls to the owner. The footpath to the beach was handy but boggy underfoot. Our fault for coming in a wet October. We are located within the small coastal village of Saundersfoot, 5 miles from Tenby. Everything you need for a lovely family holiday is here. Restaurants, convenience stores, pubs, shops, a lively harbour, and gorgeous beaches. If you fancy a day out you will find yourself surrounded by 186 miles of coastal paths that dip in and out of pristine beaches and quaint towns. You can discover the medieval walled towns of Tenby or Pembroke Dock or explore the nearby castles. There are over 50 beaches in Pembrokeshire - so kayaking, surfing, or just having a paddle is at your doorstep. If you love wildlife, it is here in abundance. A boat trip around Ramsey Island is a real adventure - where you are likely to see dolphins, or Sun Fish, and a plethora of bird life is guaranteed. The Pembrokeshire Coast National Park is simply a breathtaking experience. Booking Notes: Glendale cottage is a Friday changeover and is booked on a 7 or 14 day basis only (unless out of season and agreed by the owner). We do not offer refunds of cancellation, and would strongly recommend you insure you have adequate holiday cancellation insurance. A surcharge of £25 per dog per week will be charged. A flat fee of £50 will be charged if we need to clean up dog dirt from the garden or if there is evidence that your pet has been on the furniture. A flat fee of £50 will be charged if the waste disposal instrurctions have not been followed.